Since their glorious All-Ireland final win last September, much of Galway's time has been taken up by team holidays, celebrations and school visits with Liam MacCarthy, but Micheál Donoghue's side narrowly avoided a crash back to reality with a powerful finish to deny Antrim. Their lack of game-time proved a great leveller as Antrim led with seven minutes remaining, only for the Galway bench to kick-start their revival, which was finished off in added time. Galway had played their county champions Liam Mellows in a challenge 24 hours earlier, but at times they were sloppy in possession, looked heavy-legged and were out-thought by the Ulster side. But when an unthinkable defeat became a reality, the 2018 Tribesmen gleamed as they did in 2017. Determination "It was the hard way. We had to fight tooth and nail, but in fairness in the last few minutes they showed a lot of desire and determination but it is definitely one we were lucky to get away with," conceded Donoghue afterwards. "We're at a stage where we have acknowledged that we're behind the pack. Lads have to understand that when they get the opportunity, they have to take it. "We had some middling performances today, some poor performances and the biggest thing is that we go away knowing we have a lot of work to do." There were a few impressive displays from Galway, who gave time to ten of the side that started the All-Ireland final, but with their six debutants Antrim have a lot more to be happy with - even in defeat. 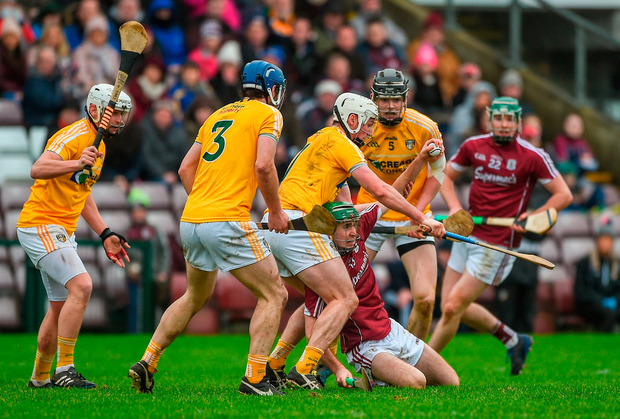 A goal from Conor McCann five minutes into the second half gave Antrim the lead, which they built into a three-point advantage by the 56th minute, but it was a pity that they couldn't hold tight for another five minutes, which would have seen Galway's nerves fray even more. "We didn't expect to be as close as we were to be honest," confessed Antrim coach Terence McNaughton. "I'm surprised with the result, with how good it was. I'm surprised with the character. A wee bit of hurling and a wee bit of cuteness and composure (was needed). These are the things that young lads have to learn." In front of 3,977 supporters in Salthill, Galway played into a very strong wind in the first half but despite being outplayed, they managed to lead 1-9 to 0-11 at the interval, thanks largely to a goal a minute from the break from debutant Brian Concannon. 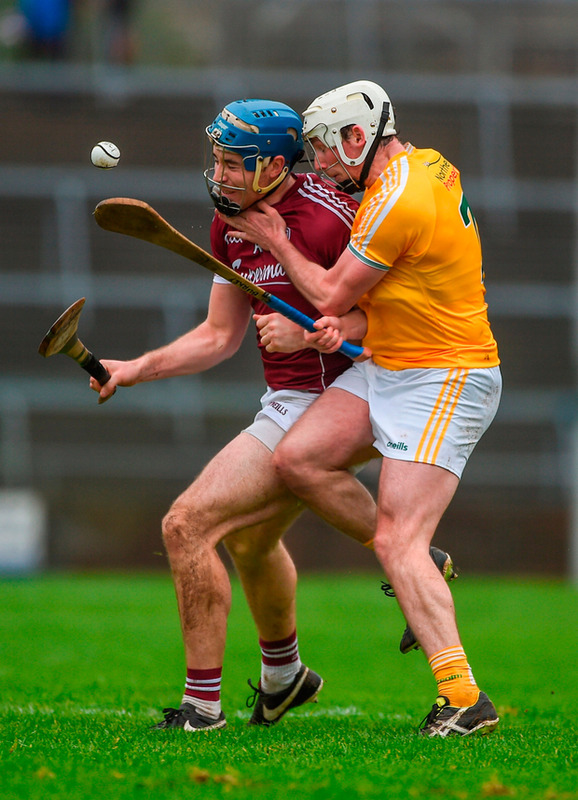 With Conor Johnston, McManus and Nigel Elliott impressing for an Antrim side, they slowly built their way back into the game after Conor Cooney had pushed Galway to a 0-6 to 0-2 lead after 12 minutes at the other end. 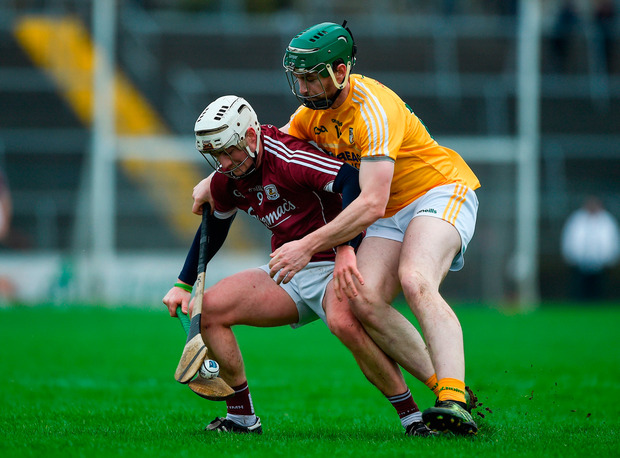 Paul Flaherty and Niall Burke pointed for Galway either side of Nigel Elliott's point, but four of the next five points went to Antrim as they punished plenty of sloppy Galway play. Concannon's goal from a tight angle gave Galway a lead they scarcely deserved at the break, but McCann hit back after the restart to restore Antrim's advantage. In their best period of dominance Antrim fired four points in the next 11 minutes, which gave them a three-point lead to defend, but Neal Peden's men couldn't add the insurance score they needed. 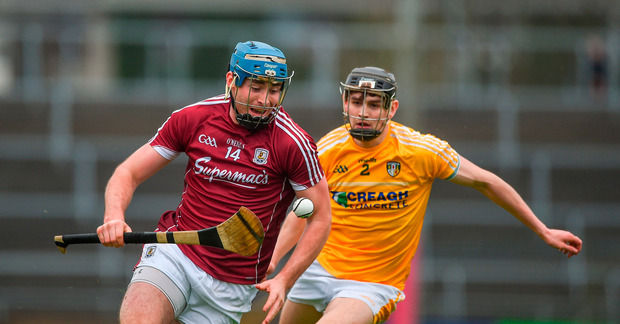 Instead Galway upped their intensity as sub John Hanbury and Eanna Burke settled the Tribesmen, while Davy Glennon levelled matters with six minutes to go. And in the closing minutes Galway finished off their rivals with two more subs, Davy Glennon and Cathal Mannion, pushing them on to the win. Scorers - Galway: C Cooney 0-6 (4f, 1 '65); B Concannon 1-1; J Cooney & E Burke 0-3; N Burke, P Flaherty, M Dolphin, J Hanbury, D Glennon & C Mannion 0-1 each. Antrim: N McManus 0-10 (7f, 1 '65); N Elliot 0-3; C McCann 1-0; C Johnston, G Walsh & D Kearney 0-1 each. Galway - J Skehill 5; M Donoghue 7; D Burke 6, J Grealish 7; A Tuohey 7, M Dolphin 8, A Harte 5; J Coen 6, E Burke 8; N Burke 5, J Cooney 8, P Flaherty 7; B Concannon 7, C Cooney 8, J Flynn 5. Subs: C Mannion for Concannon (30-32, blood), S Loftus 7 for Harte (h-t), G McInerney 7 for Grealish (41), C Mannion 8 for Flaherty (47), J Hanbury 7 for Donoghue (50), D Glennon 7 for Flynn (60). Antrim - C O'Connell 8; A Graffin 7, J Dillon 8, D Kearney 7; J Maskey 7, M Donnelly 8, P Burke 7; C McKinley 7, G Walsh 8; M Connolly 6, N McManus 9, N Elliott 8; C Johnston 8, C McCann 6, D McKinley 8. Subs: J Connelly 7 for Connolly (27), J McNaughton 5 for Elliot (65), E O'Neill 5 for McKinley (67).